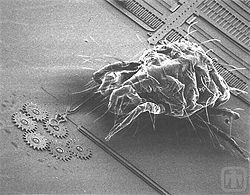 A mite next to a gear set produced using MEMS. Courtesy Sandia National Laboratories, SUMMiTTM Technologies, www.mems.sandia.gov. Microelectromechanical Systems (MEMS) are microscale devices and systems that integrate electronic components with mechanical ones. They are also known as micromachines or micro systems, and the technology is called micromechanics. (MEMS, however, is distinctly different from the vision of molecular nanotechnology or molecular electronics.) These devices generally range in size from less than one micrometer (a millionth of a meter) up to one millimeter (thousandth of a meter). The design and fabrication of these systems represent major breakthroughs in miniaturization technology, leading to a paradigm shift in engineering and opening up a wide range of applications. MEMS are used in accelerometers and gyroscopes in modern automobiles, inkjet printer cartridges, pressure sensors, chemical sensors, micro engines, micro transmissions, displays for certain types of projectors, and optical switching technology for data communications. Fabrication of these devices involves the use of various technologies, including modified silicon fabrication technology (used to make electronics), molding and plating, wet etching, dry etching, and electrical discharge machining (EDM). At the microscales involved in MEMS, the standard constructs of classical physics do not always hold true. The devices have a large surface area to volume ratio, as a result of which surface effects such as electrostatics and wetting dominate volume effects such as inertia or thermal mass. MEMS technology can be implemented using a number of different materials and manufacturing techniques. The choice of these depends on the device being made and the market sector in which it has to operate. Silicon is the material used to create almost all integrated circuits used in consumer electronics in the modern world. The economies of scale, ready availability of highly accurate processing and ability to incorporate electronic functionality make silicon attractive for a wide variety of MEMS applications. Silicon also has significant advantages engendered through its material properties. In single crystal form, silicon is an almost perfect Hookean material, meaning that when it is flexed there is virtually no hysteresis and, hence, almost no energy dissipation. As well as making for highly repeatable motion, this also makes silicon very reliable as it suffers very little fatigue and can have service lifetimes in the range of billions to trillions of cycles without breaking. The basic techniques for producing all silicon-based MEMS devices are deposition of material layers, patterning of these layers by lithography and then etching to produce the required shapes. Even though the electronics industry provides an economy of scale for the silicon industry, crystalline silicon is still a complex and relatively expensive material to produce. Polymers on the other hand can be produced in huge volumes, with a great variety of material characteristics. MEMS devices can be made from polymers by processes such as injection moulding, embossing, or stereolithography and are especially well suited to microfluidic applications such as disposable blood testing cartridges. Metals can also be used to create MEMS elements. Although they do not have some of the advantages of silicon in terms of mechanical properties, they can be highly reliable when used within their limitations. Metals can be deposited by electroplating, evaporation, and sputtering processes. Commonly used metals include gold, nickel, aluminum, chromium, titanium, tungsten, platinum, and silver. One of the basic building blocks in MEMS processing is the ability to deposit thin films of materials. A thin film generally has a thickness anywhere between a few nanometers to about 100 micrometers. Commonly used deposition processes are: Electroplating, Sputtering, Physical vapor deposition (PVD), and Chemical vapor deposition (CVD). Lithography in the MEMS context is typically the transfer of a pattern to a photosensitive material by selective exposure to a radiation source such as light. A photosensitive material is a material that experiences a change in its physical properties when exposed to a radiation source. If one selectively expose a photosensitive material to radiation (for example, by masking some of the radiation), the pattern of the radiation on the material is transferred to the material exposed, as the properties of the exposed and unexposed regions differs. This exposed region can then be removed or treated providing a mask for the underlying substrate. Photolithography is typically used with metal or other thin film deposition, wet and dry etching. There are two basic categories of etching processes: wet and dry etching. In the former, the material is dissolved when immersed in a chemical solution. In the latter, the material is sputtered or dissolved using reactive ions or a vapor phase etchant. Wet chemical etching consists in a selective removal of material by dipping a substrate into a solution that can dissolve it. Due to the chemical nature of this etching process, a good selectivity can often be obtained, which means that the etching rate of the target material is considerably higher than that of the mask material if selected carefully. Some single crystal materials, such as silicon, will have different etching rates depending on the crystallographic orientation of the substrate. One of the most common examples is the etching of silicon in KOH (potassium hydroxide), where certain planes (known as Si ) etch approximately 100 times slower than others. Therefore, etching a rectangular hole in a (100)-Si wafer will result in a pyramid-shaped etch pit, instead of a hole with curved sidewalls as it would be the case for isotropic etching, where etching progresses at the same speed in all directions. Long and narrow holes will produce V-shaped grooves. The surface of these grooves can be atomically smooth if the etch is carried out correctly with dimensions and angles being extremely accurate. Another method of changing the etchant selectivity of silicon is to heavily dope the desired pattern with boron. This technique makes the silicon/boron unetchable for silicon etches and is termed an etchstop. In reactive ion etching (RIE), the substrate is placed inside a reactor in which several gases are introduced. A plasma is struck in the gas mixture using an RF power source, breaking the gas molecules into ions. The ions are accelerated towards, and reacts at, the surface of the material being etched, forming another gaseous material. This is known as the chemical part of reactive ion etching. There is also a physical part which is similar in nature to the sputtering deposition process. If the ions have high enough energy, they can knock atoms out of the material to be etched without a chemical reaction. It is a very complex task to develop dry etch processes that balance chemical and physical etching, since there are many parameters to adjust. By changing the balance it is possible to influence the anisotropy of the etching, since the chemical part is isotropic and the physical part highly anisotropic the combination can form sidewalls that have shapes from rounded to vertical. A schematic of a typical reactive ion etching system is shown in the figure below. A special subclass of RIE, growing rapidly in popularity, is deep reactive ion etching (DRIE). In this process, etch depths of hundreds of micrometers can be achieved with almost vertical sidewalls. The primary technology is based on the so-called "Bosch process," named after the German company Robert Bosch which filed the original patent, where two different gas compositions are alternated in the reactor. The first gas composition creates a polymer on the surface of the substrate, and the second gas composition etches the substrate. The polymer is immediately sputtered away by the physical part of the etching, but only on the horizontal surfaces and not the sidewalls. Since the polymer only dissolves very slowly in the chemical part of the etching, it builds up on the sidewalls and protects them from etching. As a result, etching aspect ratios of 50 to 1 can be achieved. The process can easily be used to etch completely through a silicon substrate, and etch rates are 3-4 times higher than wet etching. Bulk micromachining is the oldest paradigm of silicon based MEMS. The whole thickness of a silicon wafer is used for building the micro-mechanical structures. Silicon is machined using wet etching. Anodic bonding of glass plates to silicon is used for adding features in the third dimension and for hermetical encapsulation. Bulk micromachining has been essential in enabling high performance pressure sensors and accelerometers that have changed the shape of the sensor industry in the 1980s and 1990s. Surface micromachining was created in the late 1980s to render micromachining of silicon more planar, to make it resemble more the planar integrated circuit technology. The ultimate hope was that MEMS and integrated circuits could be combined on the same silicon wafer. The original surface micromachining concept was based on thin polycrystalline silicon layers used as movable mechanical structures and releasing them by sacrificial etching of the underlaying oxide layer. Interdigital comb electrodes were used to produce in-plane forces and to detect in-plane movement capacitively. This MEMS paradigm has enabled to manufacture low cost accelerometers for automotive air-bag systems and other applications where low performance and/or high g-ranges are sufficient. Analog Devices have pioneered the industrialization of surface micromachining and have realized the co-integration of MEMS and integrated circuits. Both bulk and surface micromachining are still used in industrial production of sensors, ink-jet nozzles and other devices. But in many cases the distinction between these two has diminished. New etching technology, deep reactive ion etching has made it possible to combine good performance typical to bulk micromachining with comb structures and in-plane operation typical to surface micromachining. While it is common in surface micromachining to have structural layer thickness in the range of 2 µm, in HAR micromachining the thickness is from 10 to 100 µm. The materials commonly used in HAR micromachining are thick polycrystalline silicon, known as epi-poly, and bonded silicon-on-insulator (SOI) wafers although processes for bulk silicon wafer also have been created (SCREAM). Bonding a second wafer by glass frit bonding, anodic bonding or alloy bonding is used to protect the MEMS structures. Integrated circuits are typically not combined with HAR micromachining. The consensus of the industry at the moment seems to be that the flexibility and reduced process complexity obtained by having the two functions separated far outweighs the small penalty in packaging. In the future, sensors based on MEMS technology might be used for robotics simulating human touch. Micropower Hydrogen generators, gas turbines, and electrical generators made of etched silicon. ↑ Techneglas.com, MEMS Etch Stop Application for BoronPlus Sources: Micro Machining. Retrieved January 17, 2007. Berthier, Jean, and Pascal Silberzan. 2005. Microfluidics for Biotechnology. Microelectromechanical Systems. Norwood, MA: Artech House. ISBN 1580539610. Lobontiu, Nicolae, and Ephrahim Garcia. 2005. Mechanics of Microelectromechanical Systems. New York: Kluwer Academic. ISBN 1402080131. Maluf, Nadim, and Kirt Williams. 2004. An Introduction to Microelectromechanical Systems Engineering, 2nd edition. Norwood, MA: Artech House. ISBN 1580535909. Vittorio, Salvatore. 2001. MicroElectroMechanical Systems (MEMS). ProQuest CSA. Retrieved March 18, 2007. This page was last modified on 3 October 2018, at 16:51.